While the old adage “everything happens for a reason” applies to all walks of life, it may resonate more loudly with sports fans. For example, baseball fans in Philadelphia and New York have no choice right now but to believe that the failure of the Phillies and the Yankees to reach the World Series simply means that the Eagles and Giants are going to have better years than expected. How quickly fans adopt this mode of thinking merely reflects how quickly they experience the four stages of denial. Similarly, fans of the World Series participants might well be thinking that their success is well-deserved given the miserable starts of the Cowboys and the 49ers. This brings us to the start of the basketball season. Bitter baseball fans throughout the country can now turn their attention to the NBA, thinking something along the lines of, “Thank God baseball is over just in time for the start of the hoops season.” An outside observer may view this as an obvious rationalization, but others might say it further supports the notion that everything happens for a reason. Perhaps more than either the NFL or MLB, the NBA does not need to rely on fantasy teams to maintain fan interest in the broader league. This is not to say that fans of a particular NBA team are not as fanatical as other sports fans; it is more an observation that the various story lines around the league (this year arguably more than any other) and the individual star-power pervading the league make the NBA Finals interesting to its viewers even if the home team is not playing (it’s hard to make that same argument for this year’s World Series). Right now the biggest star of the revitalized Nets franchise may be their new majority owner Mikhail Prokhorov, a Russian billionaire who has been the central character in one of the NBA storylines generating headlines over the past year. 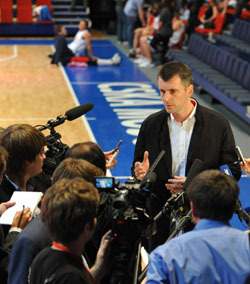 Prokhorov has voiced his ambitious intentions to make the playoffs this season and win an NBA championship within five. While it remains to be seen if the Nets season will have a fairytale ending, they have already improved upon last year’s start. 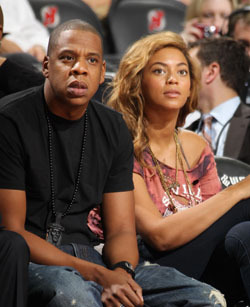 Prokhorov made it to Wednesday’s season opener along with part-owner Jay-Z, his wife Beyoncé, NBA Commissioner David Stern, Newark Mayor Cory A. Booker, New Jersey Devils owner Jeff Vanderbeek and over 15,000 fans who were treated to an exciting come-from-behind 101-98 win over the Pistons. 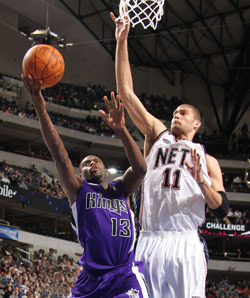 The Nets made shots, came up with defensive plays and showed determination. The Nets will need to keep winning games in order to sustain our interest and keep fans returning to the spiffy Prudential Center. Tonight Proky’s footmen will battle the Kings, another team hungry for a turnaround. We’ll see the NBA’s 2010 Rookie of the Year Tyreke Evans make his first regular season appearance, having missed Sacramento’s opening night win due to a one-game suspension. Samuel Dalembert might also be reactivated tonight if the medical staff determines that his strained left adductor has healed. The Kings have added some new faces to their roster, including the fifth overall draft pick DeMarcus Cousins out of Kentucky and Carl Landry who returns from the Rockets. I’m anxious to see how far this young, talented team has come since Summer League. Prokhorov is staying in town until Sunday afternoon so he’ll get to see the Nets in action against the Kings followed by LeBron and the Heat on Halloween. Ian Eagle and I have the call tonight at 7:30 PM EST on YES Network. I’m sure Marv will tune into tonight’s game from home to critique our performances and that I’ll hear all about it on Sunday when we’re back together for the Heat at Nets at 1:00 PM EST on YES.